The whale had ingested 115 drinking cups, four plastic bottles, 25 plastic bags and two flip-flops. A sad reminder of how our pollution affects ecosystems worldwide washed up on the Indonesian shore. The sperm whale, which would normally munch on octopus, fish, and shrimp, had ingested 6 kilograms (13 pounds) of plastic. Its carcass was found in waters near Kapota Island in the Wakatobi National Park. Given the advanced state of the decay the carcass was in, it’s impossible to say whether the plastic played a direct role in killing it, but it’s not out of the question, and it certainly had a negative effect on the whale. This is just one example of how our plastic pollution is affecting ocean ecosystems. Recent studies have shown the near-ubiquity of plastic pollution in the planet’s oceans, and a team of researchers quantified that extent to over 5 trillion plastic pieces. It has become abundantly clear that we’re filling the oceans with plastic — though there is some good news. Europe has recently announced a complete ban on single-use plastic, and anti-plastic movements are picking up steam in many parts of the developed world. Whether it’s a plastic tax, a complete ban, or some other initiative, the world is — rather timidly — attempting to address the plastic problem. However, it’s far from being enough. According to a recent report by environmental campaigner Ocean Conservancy and the McKinsey Center for Business and Environment, five Asian nations (China, Indonesia, the Philippines, Vietnam and Thailand) account for more than half of the plastic waste that ends up in the oceans. 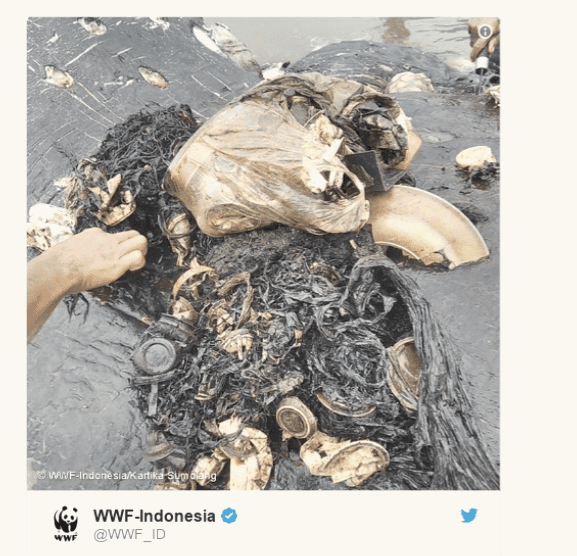 Indonesia, an archipelago of 260 million people, is the world’s second-largest plastic polluter after China. The country is responsible for 1.29 million tons of plastic that end in the ocean each year — though this year, Indonesia seems to have finally gotten serious about its plastic pollution. The Indonesian government has pledged to reduce marine waste by 70% by 2025 and spend up to $1 billion a year on cleaning up its rivers and seas. The country is also considering a plastic tax, which has done wonders in places like the UK.